Airheart presents an interesting idea with hints of brilliance, but fails to deliver a game with staying power. Whilst the upgrade system is satisfying, it's let down by repetitive gameplay and UI issues that get in the way even when playing with the endearing crafting system. Airheart: Tales of Broken Wings is a game whose crafting mechanic is a lot more interesting than the rest of the gameplay. It doesn't feel broken, it just feels like the flying gameplay is secondary to the inventive crafting. An enjoyable rogue-lite twin-stick shooter. AirHeart is a haunting game with some game's mechanics offering many hours of flight, but this is unfortunately at the cost of some repetitiveness. The possibility of making crafts and customize your plane allows you to have a gear that adapts to the way you play. The history is not unforgettable but the music that will accompany you throughout your trip deserve this rise. Airheart: Takes of Broken Wings is an enjoyable twin-stick shooter if you are looking for a colorful grind through the skies. Airheart: Tales of Broken Wings has potential but without a solid story powering it forward and lots of tedious grinding, you'll struggle to see it through to the end. While the game is visually stunning and at least exciting in principle, Airheart never quite takes flight. A game that has good ideas and will make us enjoy thanks to the beauty of its scenery and its great soundtrack. Sadly, the game seems repetitive and the excessive time we'll have to spend collecting makes the magic of the title in other facets disappear. Airheart will appeal to those who enjoy learning a game's systems by trial and error. The bizarre-sounding concept of skyfishing is ridiculous when first seen, but quickly feels almost natural. There's certainly some roguelike fun to be had in Airheart – Tales of Broken Wings, especially for fans of twin-stick shooters and classic arcade action. Unfortunately, the elements outside of skyfishing and dogfighting are more of an interference than an enhancement, and they may put you off this game before you're able to get to the good stuff. Aesthetically, the skies above Granaria are sublime. The graphics are beautiful, the music is superb, and the incredibly deep ecology of the flyfish that realistically react to overfishing patterns is so extensively detailed that I have no choice but to be impressed. However, repeating the same sections over and over to grind out money while trying to make progress with a crafting system that is so poorly explained made me dread every minute I spent with the game. There's a solid foundation for gameplay once you're in the skies chasing fish and fighting pirates, but every minute that you're not dogfighting your way through the clouds to chase exotic creatures is so frustrating and dull that I just can't bring myself to spend any more time searching for Amelia's elusive Skywhale. For a title with such a strong concept, Airheart does shockingly little with its premise. Airheart - Tales of Broken Wings is an intense twin-stick shooter that at times will have you on the edge of your seat. However, Airheart is let down by the vast amount of grinding it takes to reach its endgame, and with minimal story elements peppered throughout, it's hard to see a lot of players following through right to the very end. Airheart: Tales of Broken Wings is a great looking and fun PlayStation 4 game with an interesting premise and setting that will certainly grab your attention. The roguelike with permadeath elements are certainly not for everyone, but if you give this game a chance, I'm sure you'll find a game with a solid gameplay loop that can become very addictive. The game does not have a full trophy list with a Platinum, but it does have one trophy in particular that asks that you craft every weapon in the game, so I'm sure you'll be very busy working on that one for a while! In the end, Blindflug Studios have created a nice and really enjoyable little gem in Airheart. It's fun, addictive, and blends in together two genres in a nice way that provides a different experience from the usual shoot 'em up games available on Ps4. If twin-stick shooters are your thing, and you like some roguelike in your shoot 'em up, then you should definitely try this one! Simply put, the core experience of Airheart: Tales of Broken Wings is unconventional and addictive. Stiff controls & Sub-par crafting spoil the fun. 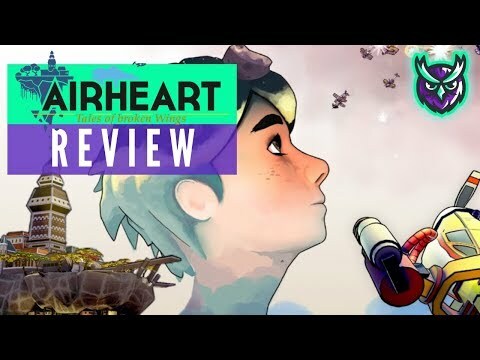 Airheart is a nice looking that sounds amazing, but it's riddled with issues that may be too damaging for some. You can't unlock all achievements in the game. You may not the able to unlock your plane parts, every so often enemies are bugged and you cannot complete levels. It's nice, but you can't expect too much. GREAT - Airheart delivers a reasonably balanced roguelike experience with a dieselpunk art style that looks great on the Nintendo Switch. Gameplay comes in the form of twin-stick arcade shooting & collecting, coupled with a trial & error crafting system that I found to be a bit annoying, but not enough to detract from the overall game. If you’re in the market for a thematically different roguelike, this game has a nicely structured game loop that delivers hours upon hours of fun.